Who is excited for Iron Man 3 to arrive in theaters on May 3rd, 2013? I know I sure am! 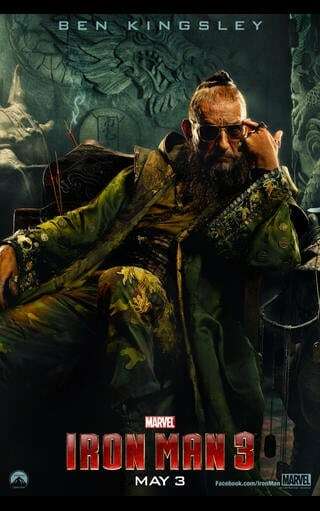 Tony Stark (Robert Downey Jr.) faces a frightening enemy, a terrorist called the Mandarin (Ben Kingsley). Check out what Stark has to say about him in the clip below. I have never seen any of the Iron Man movies because I thought I would not like them! But after seeing previews and interviews this week, I really want to see this movie! I think Iron Man 3 looks exciting! My son is a big Iron Man fan. I have watch the movies with in the past. Hello, Stacie. Who did you get to group interview from the movie? Did you enjoy walking the red carpet? I am interested to see if Ben Kingsley plays a good villain. I like Robert Downey Jr. I will likely wait for this to go to video before seeing it. Thank you for posting the preview clip, Stacie. Just saw the previews this morning. Totally stoked! looks like an exciting movie! It seems that the film is trying to further develop Iron Man’s character. I enjoyed your review and jhope to see the movie. My son loves Iron Man and can’t wait for the new movie! My daughter-in-law can’t wait to see this. I have to say the trailers and clips look really action packed and engaging. These movies are fun and keep us entertained. I love love love Iron Man…can’t wait to see this!! Can no wait to see this movie. My favorite series. Awesome, can’t wait to see it!